Kate Edwards has been a hospitality consultant in New York City for almost a decade, but before that she was a maître d’ at one of the landmarks of New York’s downtown dining scene during its heyday in the late nineties and early aughts. While the job came with a lot of perks — especially for women, who were regularly given gifts by repeat customers, like clothes from people in retail — for her actual take-home pay, Edwards relied mostly on “handshakes at the end of the night,” meaning tips she received from guests after she’d found them a table. This disparity meant that a female maître d’ received a considerably lower weekly income. Edwards brought this to her boss’s attention, and asked for a raise in order to even things out. At first, he registered some surprise, citing the figure he thought she took home. “No,” a colleague corrected him, “that’s for the guys.” Ultimately, Edwards’ employer agreed to raise her hourly wages to ensure equitable compensation. According to Restaurant Opportunities Centers United, a labor advocacy group, close to seventy percent of the nation’s tipped workers are women. The national minimum wage for tipped workers is far less than the national or statewide minimums for workers in general — it has been frozen at $2.13 an hour since 1991 — and since most, if not all, of a tipped worker’s hourly income goes to taxes, most are forced to sustain themselves on their tips alone. Since pay based on gratuity can vary significantly from day to day and from week to week, workers are often forced to endure unsafe working conditions, hostilities from their supervisors, and harassment from co-workers, employers, and customers. As the ROC notes, thirty-seven percent of sexual harassment complaints to the Equal Employment Opportunity Commission come from the restaurant industry, making it the largest source of complaints of any industry nationwide. Recently, several prominent figures in the New York dining world have announced plans to address some of these issues. They will accomplish this, they claim, by eliminating tipping altogether from their restaurants. The trend is being spearheaded by Union Square Hospitality Group (and Shake Shack) founder Danny Meyer, who announced plans last October to gradually replace what he calls the “icky” custom of tipping in all thirteen of his full-service restaurants with a system that he’s calling Hospitality Included. (I should mention here that in the past six years, I have worked in two of them.) Since then, Andrew Tarlow, who was instrumental in creating the modern Williamsburg dining scene in the early aughts, has followed suit, along with other restaurateurs, in varying degrees, like Gabe Stulman of the “Little Wisco” empire, Anita Lo, and David Chang. To generate momentum, Tarlow’s company also designed a “non-proprietary” gratuity-free logo which it hopes will be used by other operators to create a coherent visual vocabulary to alert the city’s diners as the trend picks up steam. Strategies differ from restaurant to restaurant, and company to company, but in general, the broad strokes are consistent: Eliminate gratuity, hike menu prices, and raise worker wages. In Meyer’s gratuity-free restaurants, for instance, prices have risen around twenty-five to thirty percent in order to increase overall restaurant revenue. Meyer’s lowest-paid employees, who would normally be paid the statewide hourly minimum of $9, will immediately receive a $2-an-hour wage hike. (As Eater’s Ryan Sutton has pointed out, however, this still keeps them far below the city’s $14.30 living wage.) According to Erin Moran, the Chief Culture Officer for Meyer’s restaurant group, instead of receiving a small hourly wage plus tips, Meyer’s servers, bartenders, and other front-of-house workers, will see an increase in their hourly pay, and will also participate in a revenue-share program based on the restaurant’s overall sales. Mainstream press coverage has tended to take it for granted that the no-tipping trend is genuinely reformist, if not borderline charitable. What has been less emphasized, however, is that the move to increase menu prices and adjust workers’ hourly pay, particularly at the higher end of dining, is primarily a business decision. In New York City especially, it will mitigate the impact of impending minimum wage legislation at the city and state level for both fast food and full-service restaurants; starting in January, new minimum wage laws effectively raised hourly wages for tipped workers by fifty percent, from $5.00 to $7.50 per hour, and Governor Andrew Cuomo is leading a charge to raise the statewide minimum for all employees even further — to $15 an hour over the next three years. It’s thought that increasing the amount of revenue that comes directly into restaurants will enable operators to better manage this new set of financial obligations in an industry notorious for low profit margins — Abram Bissell, head chef at the Modern, claims that his restaurant operates at margins of about seven percent. It also opens restaurants up, however, to new forms of risk, like higher taxes. Leah Campbell, HR and Communications Director for Tarlow’s group, told me that her company’s workers were surprised to learn that employers like Tarlow receive a personal tax credit for employing tipped workers. According to Campbell, the original intention of this measure was to ensure honest reporting of tipped wages, but it now remains as something of a perk for owners to keep their employees reliant on tips. “It is our understanding this law is in place to incentivize owners to make sure tips are reported for taxes,” she told me, “but it now has the effect of being an incentive to remain in the broken system of tipping.” Campbell is likely referring here to a FICA tax credit that allows restaurant owners to recuperate taxes on employee wages earned through tips (which is income earned beyond their hourly wage.) For obvious reasons, this credit is beneficial to employers, but it also effectively operates as a loophole that rewards keeping workers employed in a tip system, since doing away with tips means that owners are now responsible for paying FICA taxes on their employees’ full salaries or their far higher hourly incomes. Besides this, paying employees directly also means that operators are now fully responsible for covering expensive credit card processing fees, which, at least in Meyer’s case, have been taken out of employees’ pooled tips since 2011. At this moment of heightened public attention to the ways restaurant workers are compensated for their labor, it’s an opportune time to think about the mechanics of this distribution. Even though the no-tipping trend promises higher wages for some and less workplace anxiety for others, it still does not ensure equity all around. The front-of-house employee I spoke with was concerned, she told me, because “I don’t know how much a BOH employee gets paid — that’s not been announced, because it’s individually based. This makes me wonder if gender inequality is still at play.” This inequality would be in keeping with industry standards. Women occupy only nineteen percent of chef positions industry-wide, and in any given position, a female worker can expect to earn seventy-nine percent of what a male counterpart earns. When you add race as a consideration, the outcome is even worse: According to the ROC, a black female server makes sixty percent of what a white male server does. Race is a particularly tenacious issue in the service world, and as ROC founder and Director of Food Labor Research Center at University, Berkeley, Saru Jayaraman, reports in her recent book, Forked: A New Standard for American Dining, practices of racial discrimination are deeply imbedded in restaurant culture, especially when it comes to hiring, compensation, and promotion. 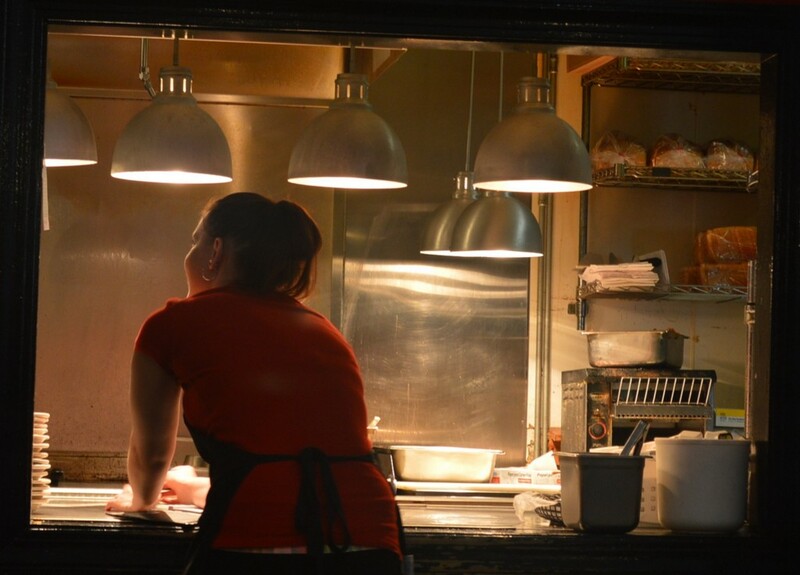 In its 2015 study, Ending Jim Crow in American Restaurants, the ROC noted that the most highly compensated tipped positions in the industry are held by white men, and “even those people of color employed in these typically higher wage categories earn substantially lower average wages.” People of color are routinely relegated to back-of-house positions, like line cooks, prep cooks, and dishwashers; in general, there is a sharp divide in terms of overall earnings between front-of-house and back-of-house employees, and the relative invisibility of these workers renders them one of the most vulnerable and undercompensated segments of the industry’s work force. While a no-tipping system may certainly begin to even the playing field between employees who hold front-of-house positions and their historically less well compensated back-of-house counterparts, it does not ensure that high-paying positions are available to all employees regardless of race, nor that standards for methods of career advancement (like promotions and raises) are race- or gender-blind. Some twenty-eight percent of restaurant employees who have been denied a promotion cite race as the primary cause. Both Campbell and Moran acknowledge that much work needs to be done in order to establish a more equitable restaurant culture. Campbell wrote to me: “Are we concerned with a world where the tip credit wage is $2.13 and are we aware that across the industry harassment issues are rampant and unaddressed perhaps because service staff’s pay is supplied almost entirely by guests? Yes. Do we see the value in raising expectations and standards everywhere? Of course we do. Can we do better at addressing discrimination in our industry? Yes and we have to.” While neither she nor Moran could speak in any specific terms about what steps their respective companies were taking to address these issues, nor about any present plans for their organizations to take them up at a later date, both insist that the willingness and the energy to look for solutions is there. In lieu of relying on restaurant owners to police themselves in this regard, Jayaraman suggests that one step toward pushing companies to redress these problems may be educating diners themselves to start asking restaurants about their labor practices. Citing the moderate success of sustainable food movement in encouraging consumers to find out about how their food is sourced, how it is cultivated, and how it is distributed, Jayaraman sees some potential in teaching restaurant diners to push these questions further, and to make discerning choices about where they spend their money based on the working conditions of the people who serve them their food. As she put it over the phone, “If you can ask about, is this tomato organic, and how are the chickens treated, can’t you ask how the people are treated?” In her book, she uses her own experience as an example, citing instances when she has approached restaurant owners and managers to compliment the food and service but also to express concerns over apparent racial divides among workers, or to ask specific questions about worker benefits and compensation.